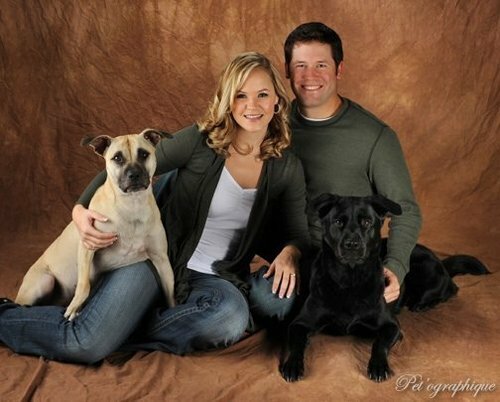 Oh, this is just too adorable — here is a family picture of PGA Tour rookie Alex Prugh, his lovely fiancee and their dogs (or their “children”). Now does this eerily remind you of another golfer’s family portraits that were broadcasted to the world via his website? You know, like this one. In only his third start on Tour, Prugh played his way to the top of the Bob Hope Classic leaderboard after three rounds and remained tied with Bubba Watson for the lead after Sunday. With the fifth and final round well underway, Prugh is currently in fifth place and two-under through 15 holes, four shots behind the leaders. He’ll need a couple of birdies coming down the stretch for a shot at the title. Regardless, his performance has impressed the golfing world, particularly how well he’s handled the pressure. Prugh, a graduate of the University of Washington, qualified for the PGA Tour after two seasons on the Nationwide Tour. He finished 16th on the 2009 Nationwide money list last year to secure his card to compete with the big boys. Update: Prugh carded a final round 67 for a five-day total 28-under to finish fifth, two strokes behind champion Bill Haas.